The dental industry is awash with pirates and robbers presenting glamorous gifts to unsuspecting dentists. For some reason, dentists make easy prey for charlatans and shysters. No matter how bad the economy is going, nobody, and I repeat NOBODY out there in the community cares if a dentist is doing it tough. When was the last time you saw a hard luck story on A Current Affair about a dentist? Nobody cares if a dentist has been ripped off. About twenty-two years ago, I was introduced to a property developer selling thirty soon to be completed apartments in a suburb of Sydney. The apartment block was located close to rail and bus, and right opposite a major shopping center. It was also about 100m walk away from a large suburban park and it was adjacent to the nearby café district. I purchased one of the apartments prior to completion for $295000.00, which seemed a reasonable price at the time. Over the following five years, I endured tenant after tenant after tenant, and problem after problem after problem…it was a landlord’s nightmare. After five years, I contacted the managing realtor to set up a meeting about the possibility of selling the apartment. It was once said to me that dentists have the word “Sucker” indelibly tattooed across their foreheads. Sadly, this tattoo is invisible to the dentists and their colleagues, but it is like a neon sign to pariahs and charlatans looking to make an easy buck. Enter from stage left: The Dental Roll-Up…..
As a business model, what could be easier than offering a dentist a large chunk of money for his dental practice? And then getting that dentist to work on in that dental practice on contract paying the new owner a pre-determined profit for each and every year of the contract? And if you’re a smart operator, you’ll get your legal team to make the agreement a thousand pages thick. And you’ll get your lawyer to put the sale price on the first page, and then bury the employment agreement and annual profit goal deep into the back end of those one thousand pages. The roll-up entity knocks on your door and offers you, say $2.5M for your dental practice. So now they have your attention…. But half a million of the sale price is in shares of the roll up company. Still, you think, $2M is a lot more than what you could get selling the practice to another dentist…. And you get to work on in the practice you just sold…. The roll-up guys set you an annual profit target of $600K per year to hit for them. You know that will be easy, after all, there are no equipment leases to pay any more as those are all being settled in the sale…. You sold your practice five years ago and you have $2M. And over the five years, you’ve repaid the roll-up company five lots of $600K? And they now have your practice…. So if you hadn’t sold your practice to them, you’d be a million dollars better off, and you’d still have your practice? And what if you stay on with them after five years? 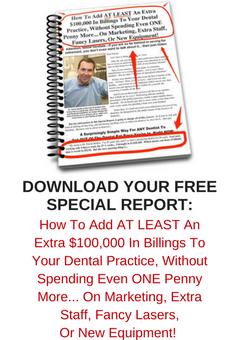 In the situation above, every subsequent year that you stay on you give the purchaser of your practice another $600K, just for the privilege of working on in what used to be your dental practice…. Doesn’t that sound like the icing on the cake? But there are other benefits of selling…. Of course, now that you have sold the practice that you used to own, you can become an employee of the new owner, and receive the statutory entitlements of being an employee, such as sick leave, parental leave, annual leave, and long service entitlements. After all, you’re working for the roll-up company now, aren’t you? And you’re working primarily for them aren’t you? I sold that apartment after five years for $347500.00 and became only the second owner in that development to get their money back… after taxes that represented an annual yield of 1.6% for each of the five years…pretty poor effort that…. The names, places and stories in this article are purely fictional. Any similarity to any person, or entity, living or dead, or dying, is purely coincidental, or paranoia. Last week Jayne and I were away learning in Queensland. On our last night, we dined out with friends from Victoria who just happened to be up there, most likely escaping the terrible Melbourne cold weather. The restaurant my friends chose for dinner was very busy. After being seated, and continuing on with our conversations, it felt as if we had all been chatting for what seemed like an eternity…. but sadly, no-one had come to take our food or pre-dinner drink orders. My friend got up and went looking for a staff member. When he returned, he remarked that he had been told that the restaurant was sadly understaffed this evening. After all, how many times have you been out for dinner and felt RUSHED by the staff and the overly quick serving of one course straight after another? A very apologetic waitress appeared, and did a wonderful job putting us at ease and taking our detailed order, paying due consideration to the dietary requirements of certain members of our party. Our meal was served promptly and efficiently, and my friends and my wife and I enjoyed a wonderful evening. After completion of our main course, the restaurant manager appeared and again apologised for the situation of his restaurant being under-staffed this evening. What he then said came as a complete and total surprise…. If ever a diner was going to be angry, a comment and an offer like that one is the ultimate diffuser. This manager totally recognised that diners were experiencing what’s known in business as a SERVICE DEFECT. And he was doing his best to negate that defect. And negate it he did. How Can We Apply This Lesson To Dentistry? In 2014, I saw a new patient to the practice for a relief of pain appointment, scheduled first thing, at 7:00am. The appointment had been booked the day before, and the treatment that was provided to the patient was a pulpal extirpation and a dressing and a temporary restoration. I think the patient was then being referred to an endodontist for the molar root canal therapy. Anyway, following the treatment, the dental receptionist processing the patient came running back to me to let me know that the patient was challenging our fee for today’s treatment. When I met with the patient, he told me that when he had called the day before, he had not been informed about the potential cost for today’s visit. And as it happened to be, the person who had scheduled the appointment yesterday was not in the office this morning to confirm or to clarify the conversation they had had with this patient yesterday. So what did you do David? Firstly, I apologised to the patient for the misunderstanding and miscommunication on yesterday’s phone call. Although I had not been provided with any “report” on that call, and because I had no way of confirming or denying the patient’s memory of that call, the only thing I could do was accept the patient’s version of the event. To me, it felt that this patient was looking for an argument about the fee. I’m going to let you decide what you want to pay me for today. Obviously, I’ve performed treatment on you today that has gotten you out of pain. And with that, I left the room. Why did you do that David? In this day and age, when it is so easy for someone to leave a negative review on the internet, I wanted to make it so clear that it wasn’t about the money. And that’s not a good place to be. Sometimes we get into situations where we would rather not be. But because we do not have a time machine, we are stuck there in the present moment and we have to make the best of what we’ve got at our disposal at the time. Cutting our losses, and making a clean getaway with minimal damage, is often the best strategy. I’ll certainly be going back to that restaurant next time I’m in Queensland…. Would You Steal Another Person’s Intellectual Property? There is only so much finite information in the world. Sure, there are new innovations every day. On the other hand, there are a lot of things simply being rehashed and rehashed and rehashed. And his response to me was that most golf club designs are the same. He said that nearly all golf clubs are really just the same as each other. Cavity back irons using perimeter weighting? That was a revolutionary design. As was the invention of the hybrid club. And he was correct, and is still correct. The principles of most businesses and most ways of doing things do stand the test of time. And unless you are an innovator, like Steve Jobs, there are very few opportunities to be an inventor. Well, you could do what I do? You could look outside of the box, and look outside of your industry, and see what other industries are doing and then see whether you can apply those thoughts and discoveries back to your industry where nobody else had really thought of using them? Do you remember me talking about the hot towel? And about the post it note? And the restaurant seating card? These were all thoughts that I had about things from other industries that I then took and applied into my practice of dentistry. One thing that I also see people do is to steal other’s and others’ IP and relabel it as their own. And this could be the blatant stealing of presentation notes and slides and powerpoint presentations, which sadly, I have seen done. I once saw a new-found dental guru transcribe an article written by someone else and pass it off in their own blog as if it were their own. And I’ve seen people take other people’s key phrases and brands and use them in their own material to create some false “association”. I’ve just recently seen phone scripts that I’ve been teaching being cherry-picked into another’s presentations, as if that person made those phrases up themselves. Which is really disappointing to see….. I don’t think theft is kosher even if you can get away with it? It certainly leaves a bad taste… do these people think nobody really notices? And we stopped for some lunch and refreshments at half way. As we sat down at the table a waitress showed up with twocoffees. Where did this sort of ATTITUDE in a waitress come from? Did we look like practical jokers? Were practical jokes like this par for the course at this golf club? So we called her back again. And she took the coffees away. And then the original orderers of those coffees appeared. And we were royally pardoned. And in fact, the waitress in question, returned to apologise to us for her slip up. I’m not sure what happened there originally, but for all intents and purposes my client and I were virtually accused and “labelled” by this waitress as being troublesome and mischievous. I’m unsure as to what her pre-conception had been, but her failure to embrace our comments as being real and truthful was certainly a point of concern. This was no public bar or nightclub. This was a prestigious golf club on a Friday at lunchtime. I could only wonder what exactly she had on her mind that she would even contemplate addressing two patrons [or members for that matter] in this manner? This is one of the principles of doing business. Make sure that the customer feels that the decision they are making is indeed the correct decision, in their eyes. However, if there does appear to be a moment of conjecture, the best approach as a staff member is to look objectively at what has just occurred and try to have a resolution that does not involve the “chopping down” of a customer. For what it is worth, winning a battle against a customer is not something clever to do if it goes towards the losing of a war…. Well, fortunately, the true owner of the coffee order did appear and the coffees were claimed, or allocated, and an apology was issued to my client and me from the waitress in question. But it should never have ever happened, should it? When my friend and I originally declined the coffees and stated that they were not ours, the waitress should have removed them, and gone and found out who they originally belonged to. Instead of launching into her own game of blame. What she did was assume that there was no error in her system and delivery. Then there would have been no problem. Sadly, this waitress presumed us guilty of ordering these coffees. The clear lesson here is to review all the information and make a decision based on all possibilities, rather than to presume an action and an “intent”. Sure you can think there may be an “intent” but without true evidence, a blind accusation can lead to tears. Years ago, as a dentist, I was delayed from seeing a patient while I was performing a difficult surgical extraction on another patient. The delayed patient just got up and walked out of my office. I decided to phone the patient that afternoon to follow up and find out what happened. Sure we had the golf on the TV in the lounge out front where the patient was sitting, but down back, in the engine room, there were no TVs present, as I sweated over that broken tooth fragment. And sure, it seems that this patient was not fully informed on why I was not seeing him on time. But his supposition of putting two and two together to make five was way off the mark. And so a patient was lost to the practice. Partly from our failure to keep him updated. And partly I believe from him being embarrassed that he had jumped to a premature, incorrect conclusion. Don’t ever take an action without all the facts. And sometimes, taking no action is a whole lot better than taking a premature, incorrect action.